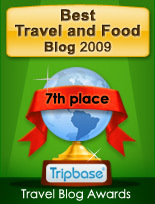 Enjoy - Food & Travel: My brothers "kabaret"
My brother and sister-in-law are great cooks. Every Christmas they prepare a large buffet for friends. One of my favourites on the buffet table is "kabaret". The term "Kabaret" has two meanings. One is a form of entertainment performed on stage at a restaurant or nightclub. The other is a dish in which ingredients are set into a gelatin made from a meat stock or consommé. Kabaret - Aspic dishes used to be more popular in my mothers generation, but you still get aspic dishes on buffets, and you may purchase them ready made at your grocers. Making a Kabaret is an assembling job, more than cooking really. 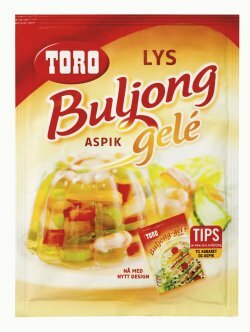 This as the aspic-consomme is bought ready made in packages, as this Norwegian product made by Toro. My brother makes an aspic with fish and seafood products. My brother and sister-in-law use fresh peeled shrimps, hard boiled eggs, canned asparagus, peas, and other vegetables. My mother used to dice fish balls as well. Place vegetables in a large bowl. My brother placed the sliced eggs in the bottom (i.e. top of the kabaret, as it will be turned around). 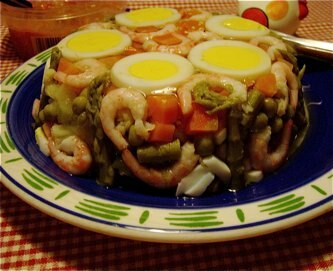 Boil up water, dissolve aspic powder in the water and pour over the vegetables, eggs and shrimps. Place in refrigerator until aspic is completely stiff. Serve with bread and mayonnaise. 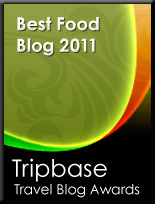 wow this is a really crazy and interesting dish. I've never seen this before. I'd love to try this one day.